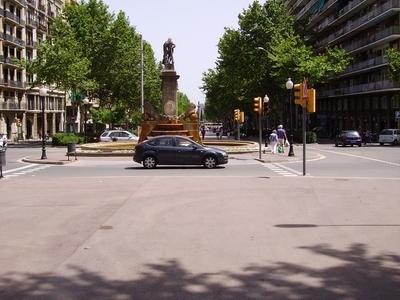 Passeig de Sant Joan (Catalan pronunciation: [pəˈsɛdʒ də ˈsaɲ ʒuˈan]) is a major avenue in the Eixample and Gràcia districts of Barcelona. It was named after an older street carrying this name, also known as Passeig Nou, built in 1795 around the glacis of the Ciutadella fortress. It starts at the Arc de Triomf, where it meets Avinguda de Vilanova, Carrer de Trafalgar and Passeig de Lluís Companys (its continuation towards the Parc de la Ciutadella), and continues westwards through the Eixample district until it reaches Travessera de Gràcia in the lower part of Gràcia. Here's the our members favorite photos of "Famous Streets in Barcelona". Upload your photo of Passeig de Sant Joan!